Unless a person is convinced the heathen are lost, they won't sacrifice to seek their deliverance. Are those who are without the gospel going to hell, or will God allow them into Heaven. What is your conviction? The firemen readied their gear as their fire truck raced toward the burning building. As the truck pulled to a stop, the firemen determinedly carried out their various tasks. While some firemen began to spray down the two-story home, another crew entered it, looking for anyone who might be trapped inside. As the men moved cautiously from room to room, they heard a loud cracking sound. "The roof is caving in," the squad leader yelled. "Pull out! Pull out!" With this, the squad made its retreat. Once the crew was outside, the Captain said, "We can’t save this building. Concentrate your efforts on the surrounding buildings. Following his command, the firemen turned their hoses on the homes closest to the fire. "What’s that sound?" asked fireman Smith. "What’s making that crying noise?" After listening, one of the firemen interjected, "That’s just the draft of air being sucked in by the fire." "No!" said Smith. "It's definitely human." Suddenly, the eyes of all of the firemen expressed terror as they realized that the crying sound was coming from a baby trapped inside. Smith, thinking about his newborn baby at home, said, "We have to go in." "That’s suicide," stressed another fireman. "You have no idea what room the child is in." "It just as easily could have been my child inside there." Having said that, Smith darted toward the inferno. "Get back here, Smith," demanded his Captain. "That’s an order!" Undaunted, Smith entered the building. "You two," the Captain instructed. "Grab a hose and follow him in as far as you can. Try to secure an exit for him." 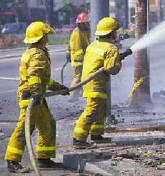 Pointing to two other firemen, the Captain said, "Grab that hose and follow behind the first hose. Keep those guys soaked. They’re going to need you to protect them from the surrounding fire." Following the direction of the screams, Smith worked his way up the stairs. Suddenly, a burnt step breaks and Smith falls on his face. Determined, Smith pulls his injured leg out of the hole and crawls up the remaining steps. Finding the baby, Smith puts his precious cargo under his jacket and makes his descent. Fortunately, the cool tunnel, created by the fire hoses, provides a safe passage. Once outside, Smith is treated for burns on his face, hands, and legs. Everyone is praising him as a hero. He shrugged it off, however, saying he was only acting as a father. Smith risked his life and suffered multiple burns in order to save the trapped child. He even risked being disciplined for disobeying a direct order and endangering the lives of the other firemen. Do you think Smith would have made these sacrifices if he weren’t convinced the child would die without his help? If Smith believed there was a good chance the child would be safe without his help, do you think he would have gone in? I think the answers are obvious. This same question applies to reaching the lost for Christ. Will a Christian be willing to endure great pain and suffer incredible losses to bring the gospel to people if he wasn’t convinced they are going to Hell? Once again, I think the answer is obvious. Have you really thought about the sacrifices missionaries make to bring the gospel to hard-to-reach places? We usually think about them giving up many of the luxuries we have become accustomed to. We sometimes even think about them contracting a crippling illness or even dying at a young age. Seldom, however, do we think about the emotional, marital, and spiritual deterioration these Christians face. Marital deterioration and rebellious children are a realistic concern for these missionaries. There are many Christians workers who have lost their own vineyard (mates and children) while working in "God’s vineyard." Just as tragically, there are many Christian workers who have backslidden spiritually, never to recover. They could have avoided this spiritual deterioration if they had played it safe and not taken on such a difficult task. I ask you again, is it realistic to believe a large number of Christians would take these chances if they didn’t believe these people were lost and going to hell? Would Christians sacrifice to evangelize the whole world if they didn’t believe it was necessary? I know the answer is an emphatic no. Ultimately, our primary motivation to reach these people should not be our burden for the lost. Our primary motivation should be our desire to glorify God. (See the chapter Finding the Elusive Will of God for more information.) Yet, our actions should be based on what we believe the Bible teaches. Our priorities should be derived from the priorities laid out in the Bible. This is the purpose of these chapters. I will show you what I believe the Bible teaches on this subject and you can draw your own conclusion.